This weekend was a hot, sticky, dripping-sweat-just-sitting-around kind of affair. Summer seems to have descended upon us in one fell swoop. We didn’t ease into it the way we usually do, but I’m not complaining. I will take warm and humid over cold and snowing any day. Since both days called for rain, our plans to stain the fence white were put on hold. We’re supposed to be enjoying our summer this year (rather than working straight through it without so much as a weekend of camping,) so we didn’t try to hard to find an alternate project to keep busy with. But we accomplished something exciting nonetheless. We made progress on the hallway. The same hallway we gutted last July. We’ve been ignoring it on and off for a year now, which is easy to do. It’s not a fun room, one we’ll get to buy new furniture for or put a giant chrome fixture in. Nope, it’s boring and it’s long and it’s mostly just a big drywall job. Pffft. Who wants to bother with that when there are so many other fun things to tackle? While I was away for a few days, we got final coat on everything – the hallway, stairwell, and ceilings. They even taped some seams in another bedroom just for fun. 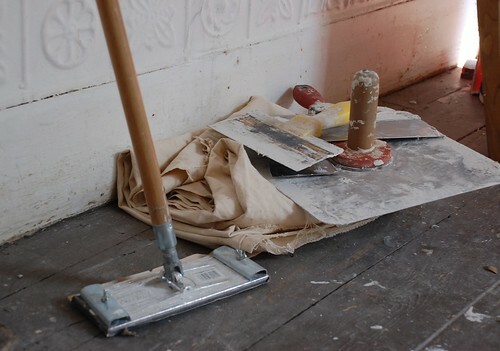 That’s what happens when contractors get together for a few beers – which is why you should all start getting chatty with those spackle encrusted guys charging through the Home Depot aisles. Today, we spent a gloomy afternoon sanding. And sanding. Oh, and sanding some more. Not that their drywall job wasn’t great – it was. It’s just that we had quite a bit of wall and ceiling to cover for such a small space. And even the best drywall job needs a swipe with the sanding pole. We’re getting smarter, though. We taped off every doorway with plastic so clean-up was (comparatively) a breeze. I remember in our early days, this seemed too time consuming. 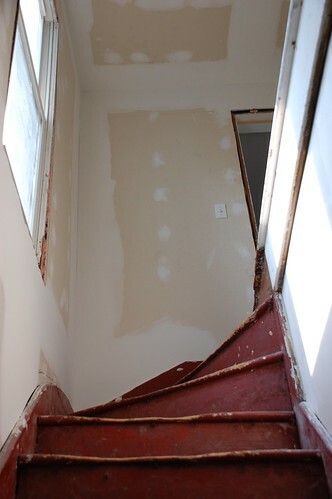 We had 3 doorways and the big stairwell entrance to tape off and we would get lazy about it, skipping the prep work. But a little effort at the beginning saves SOOOOO much time at the end. Not to mention electronics and your sanity. Oh, hooray. What a lovely prepped canvas you have there! Is it paint next? And next… paint! (What I love most about your picture is the way the steps have been worn by many years of use). What color are you going to paint?